Many moons ago, I found a script that allowed you to use the Lifeblog program that was included in some older Nokia phones and post entries to a WordPress blog. It also worked with Share Online up to version 2.0 with a small amount of tweaking. It’s still one of my most popular blog entries. Unfortunately, when Nokia decided to go to Share Online 3.0, they stripped out the ability to manually configure the client. While I’ve had access to the documentation for creating the configuration file for some time now through Forum Nokia Pro, I hadn’t gotten around to actually making a file. Fortunately, someone came up with a PHP script that does it for me (thanks to eViLrAcEr for bringing it to my attention), though I used this script instead. With that little matter out of the way, Share Online 3.0 was still failing. Turned out to be nothing more than a missing quote. I also took the opportunity to fix one issue I’ve always had with the script: the text was displaying after the pictures in the generated post. I decided the text should go before the pictures. I now have a complete system for posting pictures to your WordPress blog from Share Online 3.0. Download Lifeblog PHP and Share Online PHP. Generate a favicon.svg file. One option that’s kind of cool is a site called Vector Magic that will take a regular image and convert it to SVG . You can also use a tool like Inkscape to do it. Copy all three files to the root of your WordPress installation. Should be at the same level as wp-blog-header.php. Rename the files to lifeblog.php and shareonline.php make executable if needed. If the root directory of your WordPress installation is not writable, then you will need to create a file called atomdata.txt that is writable by the web server process. In many cases this means the file needs to be made world-writable. Ensure that wp-content/uploads directory is writable by the web server process. In many cases this means the directory needs to be made world-writable. Edit lifeblog.php. See the comments at the top of lifeblog.php.txt on what will need to be edited. Edit shareonline.php, replace all instances of http://example.com with your specific blog URL (e.g. http://lifeblogtest.co.cc). Also replace examplecom with some unique name (in service_id). 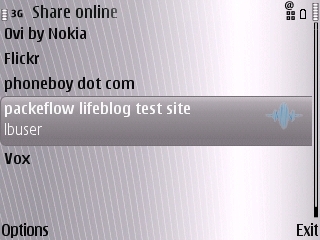 After that, you should be able to use Share Online 3.0 or Lifeblog on your Nokia handset to post to your WordPress blog. View the website (http://lifeblogtest.co.cc/), which is mobile friendly. All posts send here will disappear after 24 hours or so. If you end up using this on more than one site, ensure you use a unique filename for the .svg file on each site in order to ensure that each site maintains its unique icon. You will need to replace all instances of favicon.svg in shareonline.php with the unique filename you’ve chosen. Uncomment out any of the lines that have “logme” in them. On N93 and N73, I don’t see a clear way to get that information since it is an included app. Post the information in the comments and/or send it to me in email (contact on the right). Understand that I have a “real job” and I’m not making any money at this, so support for this script is not guaranteed. [ Update 3 January 2010 ] I have changed the test URL to http://lifeblogtest.co.cc (it was previously http://packetflow.co.cc/lifeblog/).